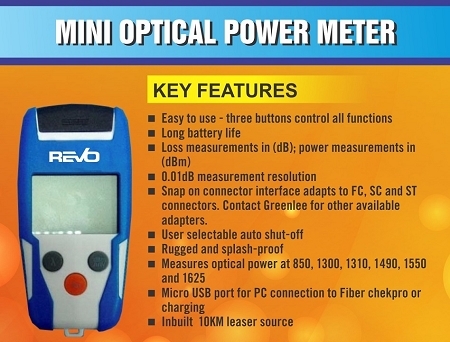 Revo power meter allows users to simultaneously measure signals upstream (1310nm) from the ONT and downstream (1490nm & 1550nm) from the OLT in FTTH/PON networks. Up to 100 data points can be stored in internal memory, which can be recalled on the LCD display at a later time. Up to 10 threshold sets can be stored in internal memory, allowing users to measure PON signals against pre-set thresholds based on different measurement points in the FTTH network. This is useful product and excellent support from Multilink.